Winter clothes retired which means my favourite season is here – WELCOME SPRING! 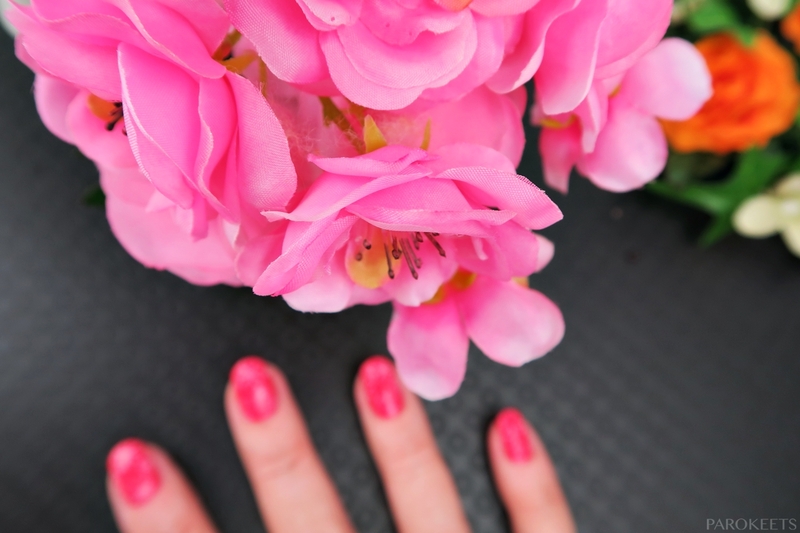 This year my spring manicures keep ending up in flower category – pink, flower images … I decided to stick to the theme and show you 4 of the manicures I wore in March. Pink is by no means my favourite colour. But I do like it in 2 versions – light and mattified shade or vibrant pink. IsaDora Pink Sugar belongs into the first group. I already wrote about nail polish in Riviera collection post, so I won’t go in depth review in today’s post. 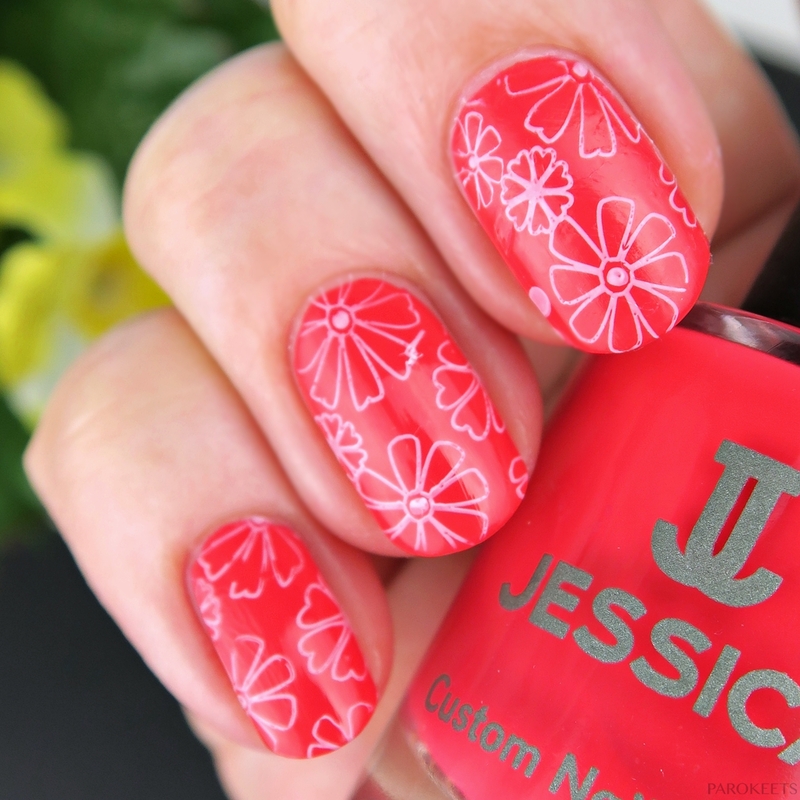 Today I have for you elegant and soothing stamping, where Pink Sugar played main role. In most cases I will ground pink with one of the more neutral shades: white, black or grey. As I wansn’t feeling two extremes I went with grey stamping and flower pattern from Mo-You stamping plate (Pro Collection XL 12). Combination that goes well with majority of my outfits (I only stay away from red items as I hate to see those 2 combined) and soothed me in time of major stress. Jessica Runway Ready (Pop Couture collection) is very pigmented nail polish, but extremely hard to describe. Shade skates on such a fine edge between pink and red that I see pink coral while everybody else keeps asking me where did I find such a gorgeous red shade. I started with an idea to do white pink gradient and then finish up with reverse pink-white stamping. But it was cursed manicure as I made mistake after mistake, so I gave up and did simple stamping over Runway Ready. Dots and animal prints are not something I like on my clothes or nails. But my two year old daughter adores dots and is able to sit still for 10+ minutes and admire my nails. 10 minutes of fun for her, and peace time for me, sounds like match made in heaven. Not to mention priceless time spent with my little one while laughing at her description of good and bad dots. No wonder I’ve been wearing more dots on my nails in the past few months than in previous 20 years. To make matters more bearable for my dot-hatting soul, I used white base and stamped with pink. Both from Hello Kitty set. Brownish Rocket Man with purple hint to it from Alessandro Cosmic Chic collection (click here for swatches), was begging to add little something to this peaceful taupe shade. I added white stamping to keep the shooting effect but still spice things up. Which manicure is your favorite for spring time?